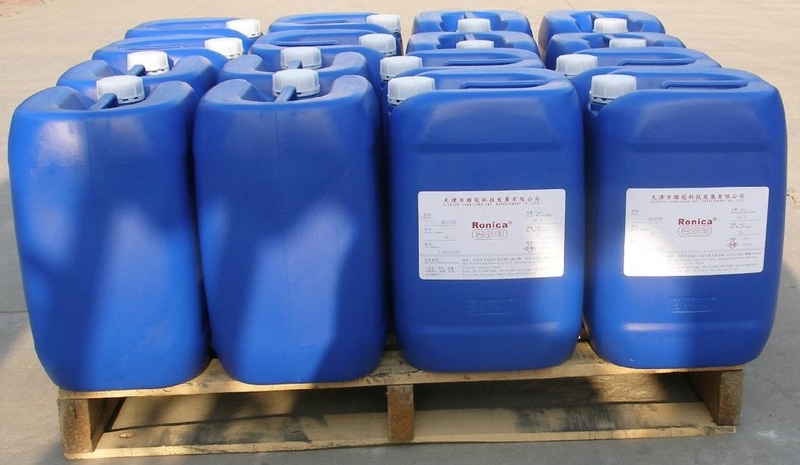 The product, a kind of dedicated liquid detergents for aluminum and aluminum alloy parts, is composed of surfactant, rust inhibitor, corrosion inhibitor and detergent builders, etc. Its main characteristics are: 1. high efficiency of oil removing(≥98%); 2. without the formation of black rust; 3. with the features which gasoline, kerosene and alkaline detergents can not compare to. 1. with powerful strength of detergency, high efficiency of oil removing, can be reused. 2. with long period of antirust, applicable to various process stages. 5. it is stable, nonflammable and nonexplosive, easily soluble in water, and easy to transport and store. 6. Low foam characteristics make the production more easily and rapidly. 1. The preparation of cleaning solution: blend as 10-20% aqueous solution by using room temperature water. 2. cleaning methods: under condition of room temperature(15-40℃), dipping the parts which needs clean in the cleaning solution, according to the actual situation, cleaning the parts by scrubbing, brushing, dipping or ultrasonic cleaning. 3. If the user need to use it by heating, the product is ok for using by heating, without affecting its performance. 1. Packing in 20kg, 50kg or 200kg plastic drum. 2. The product should be stored in dry and ventilated place. 1. The product is non-toxic, but not oral. If accidently eat it, please go to hospital for cleaning stomach and treatment. 2. The product can stimulate inner skin and mucosa, so it can not contact inner skin. 3. And for external skin, different people will have different reactions, so please adjust the exposed population group according to the actual situation. 4. If splashing into eyes, please washing by plenty of water, and go to hospital for treatment. ★: Our company can guarantee that the product meets its standard, but we do not assure it is proper under all circumstances. The instruction is compiled according to the present technology and experience of our company. It is just for your reference. Please make the adjustment according to your real demand.